Intoweb's Disciplinary System has been developed to assist employers with the process to follow when they have to discipline staff. A lot of employers have no idea what the procedures are when you need to dismiss an employee and so many employers end up losing a case at the CCMA because of their lack of knowledge. Intoweb has created an online system that provides you with the information you need to minimise your risk of losing a case again. What are the benefits of using Intoweb's Disciplinary System? The Disciplinary System runs online, which allows you to access any information from anywhere in the world at any given time, as long as you have Internet access. Search - The search facility will allow you to search for an employee using their name or selecting the relevant employee from the company hierarchy. 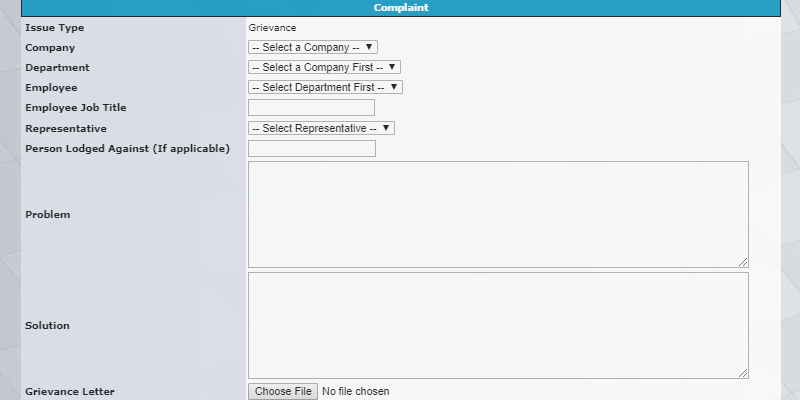 Disciplinary history - With this facility you can display all disciplinary actions and notes for an employee. Grievance - Using the grievance facility will assist you in taking the first steps in the grievance process. Fact finding - Information surrounding the case is collected. Employees are selected to provide information. Upload information - Faxes or scans of documents or actual electronic documents pertaining to the case are uploaded. Disciplinary action - This facility assists you in choosing the disciplinary actions and recommends actions based on case information. CCMA procedures - CCMA procedures are stored here for the five types of dismissal. CCMA rules - This facility lists all acts and CCMA rules that are searchable, indexed, and in an easy to use form. 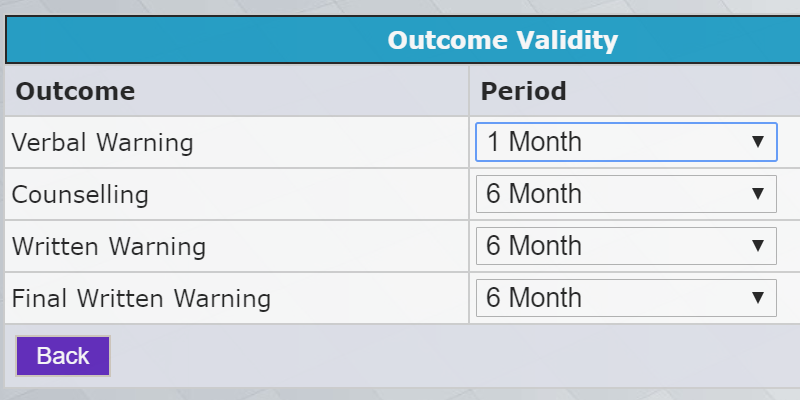 Reporting - The reporting facility will allow you to draw up monthly reports on disciplinary actions. 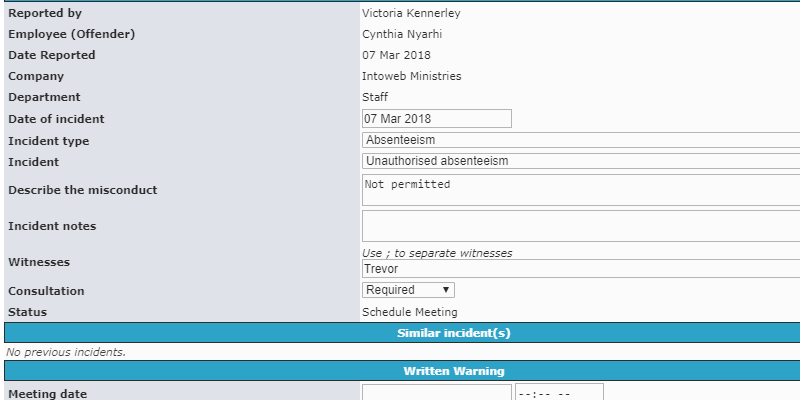 Add notes - Ability to add comments and notes to the employees file. 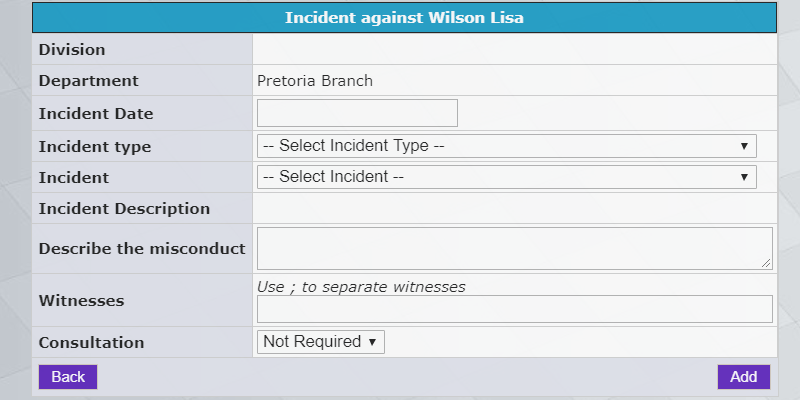 Disciplinary details - Using this facility displays the details of a disciplinary case. Configuration admin - Set various configuration settings for the disciplinary system. User adminl - Administer users that can access the system. Notification system - Configuration of system events to send emails when certain actions occur. Poor work performance - One disciplinary case is poor work performance. This section will guide the user through the proper legal CCMA required procedure for disciplinary action due to poor work performance. Ill health - Another disciplinary case is ill health. This section will guide the user through the proper legal CCMA required procedure for dismissal due to ill health. Misconduct - Another disciplinary case is misconduct. This section will guide the user through the proper legal CCMA required procedure for disciplinary action due to misconduct in the workplace. Industry action - Another disciplinary case is striking or industry action. This section will guide the user through the proper legal CCMA required procedure for disciplinary action due to striking. Time line - The time line provides guidance with respect to activities in the disciplinary process. Probation - Each employee has a probation period, which has its own procedures for dismissal. Evaluation - The disciplinary case evaluation templates. Investigation - The investigation points of the disciplinary case. Remedies - Suggested remedies for the employee due to the disciplinary case circumstances. Instruction - Instruction given to the employee. Training - Training to be given to the employee and record of actual training they received. Employee feedback meetings - Capture the information the employee presents at meetings. Rule contravened - Acts, laws and company laws contravened. Check rule validity - Checking and the sign off of the validity of the rule contravened. Employee awareness - Feedback from the employee concerning awareness of the rule, and information from management about making the employee aware of the rule. Rule consistence application - Checking and the sign off of the consistency of the use of the rule contravened. Warnings - Warnings given to employees. Generation of warning letters. Guidance - Guidance given to employees. Track record analysis - Analysis of the employee's track record and imprecations thereof. Act compliance - Contravening rule compliance with the employment act. Act compliance attempt - Investigation on how the employee tried to be compliant with the act. Justified - Information whether the employee was justified to strike. Trade union meeting - Capture minutes of trade union meetings. Ultimatum and consequences - Strike ultimatum provided and their consequences. Ultimatum analysis - Investigation whether the ultimatum is reasonable and whether it could be extended. Negotiation - Negotiations with the employee(s).